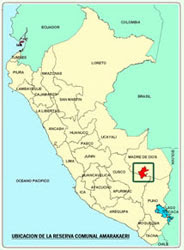 On the website of international oil company Hunt Oil we have a snippet of information one of their projects in Peru. 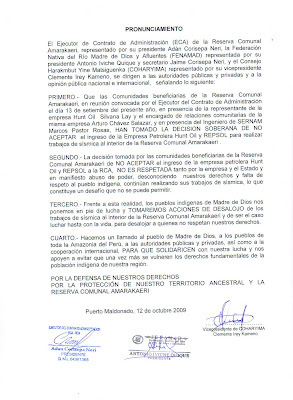 On May 2, 2006 Hunt signed a License Contract for Block 76, covering 3.5 million acres located in the provinces of Manu and Tambopata along the Camisea gas trend. 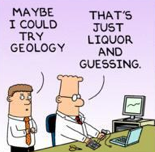 Hunt, along with Repsol (50 percent), is currently in the first 2.5-year period of the contract, which entails geology and geophysical studies, and environmental impact assessment, field study and seismic processing. The second period of the contract commences in the first quarter of 2009. 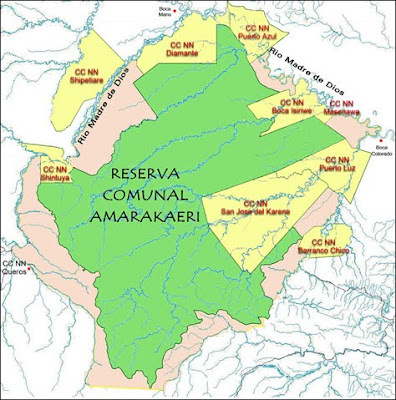 What the company fails to mention, however, is that Lot 76 is also bang inside a region known as the "Reserva Comunal Amarakaeri" (the Amarakaeri Communal Reserve) (RCA), a legally recognized and established nature reserve in the 'Madre De Dios' Amazon basin region of southern Peru. Not only is the nature reserve legally recognized by the government of Peru (an armslength of laws and regs right here) but it is also supported by international environment protection laws and bodies to protect the rights of indigenous peoples living there, the conservation of its environment and the preservation of its flora and fauna. So, as you might have guessed, Hunt Oil (who are also 50% owners of the big Camisea NatGas plant in Peru and very snuggly and cozy with the Twobreakfasts gov't) have a slightly different perspective on life than the indigenous locals that live in that jungle region and have the duty of protection for the nature reserve (both culturally and legally). The two sides have met and discussed the potential (or not) of development in the area on several occasions. According to Peruvian law, the locals in and around a protected area such as this have the final decision on whether it is developed in any way. From the start, the locals have opposed the presence of Hunt Oil and its 50% partner, Spain's Repsol, in the area. From the start, Hunt and Repsol, along with the tacit support of Twobreakfasts' crew of corruptos, have turned a blind eye to the enviro laws and locals' wishes. 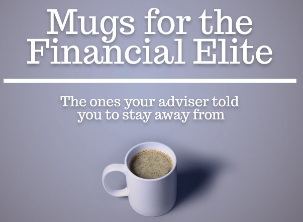 But now, watch out folks cos it's all coming to a head. 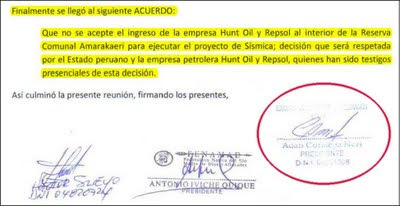 "...that the entry of Hunt Oil and Respol into the interior of the RCA to execute seismic projects is not accepted, a decision that will be respected by the Peruvian State, Hunt Oil and Repsol, who have been present witnesses to this decision"
And so, with the agreement signed, Hunt Oil did what any normal oil company would do and totally ignored it. Against the wishes of the locals and contrary to the agreement that Hunt itself signed, it has continued its seismic survey program inside the boundaries of RCA. Not surprisingly, the locals are now rather pissed. We are now at the point where the indigenous community has given Hunt Oil (and Repsol) an ultimatum: "Get out or we throw you out". ...states the locals' determination to forcibly eject, if need be, the oil company and its staff. After the death and destruction we saw at Bagua this year that came about due to a confrontation very similar to the one we're now seeing over RCA, we now have a real live potential flashpoint emergency situation on our hands. Reports coming through from the region say that there is suddenly an influx of police officers in the local town of Salvacion and that the atmosphere between the two sides is getting ugly. I'll leave you with the President of the region's indigenous organization making things crystal clear on this video interview. Either Hunt Oil (and Repsol) leave on their own accord or they will be removed. It's not too late to stop another violent episode between people who are far from the ignorant savages that the government of Peru in cahoots with their lapdog media make them out to be. These are people that have gone through all the correct channels of dialogue and have stood up for their rights. Whatever else you might hear, they do indeed have the last word as to what goes on in the RCA (Hunt Oil disparagingly calls it 'lot 76') region. They are charged with the protection of it by the laws of the land and have been more than polite so far. It's time that others stood by the people defending RCA, not only under threat from development but from their own government. 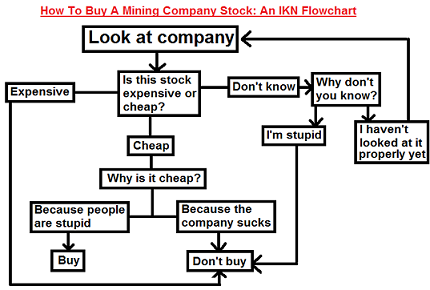 The way forward is very simple. The people responsible for the protection of this protected zone and who have the executive decision on its future want Hunt and Repsol to leave. So they must leave. The end. For more information (and word of the disinformation campaign favouring Hunt that has already started in the Peruvian press), please go to the Spanish language FENAMAD blog. Peru: Where has all the money gone?